It’s been eight days since my last post. Let’s talk about my Green Lantern wallet. If you read the title of my post, it should come as no surprise to you that I have not posted in eight days. As Dusty Rhodes might say, “Ah’m at a croth road, eef you weel”. I’ve lost my drive, my passion and my inspiration for keeping this blog ’80s themed. Don’t get me wrong, I still love the ’80s and there’s no other decade I’d rather live in but I can only do so many food, toy, cartoon and commercial posts without getting bored. There’s thousands of blogs just like this out there and we all keep running in circles talking about the same old (literally!) stuff. I think maybe I got burned out last year doing so many Halloween and Christmas posts. The funny thing is, as I’ve slacked off on posting this year, my views keep rising each month. March 2010 was my second highest month for views. December 2009 is the tops by far though. I had an obscene amount of visits then that I won’t be touching on a regular basis anytime soon. Besides, I’m having a heckuva time writing for my music blog Metal Excess. That’s really where I’ve been devoting my time. I’ve got big things poppin’ and little things stoppin’ over there. Of course, just as sure as my posting frequency at The Metal Misfit has fallen, I can pick it up again at any moment’s notice and who knows? Tomorrow may kick off a 17 day posting binge so keep me in your thoughts, prayers and Google Readers. As seen and mentioned on Friday, all kinds of shoe companies were vying to be king of the hill in the late 80s/early 90s. Everyone was so shoe crazy kids were getting beat up and their shoes stolen! The manic levels Reebok, Nike, L.A. Gear, Converse, Adidas, British Knights, etc. propelled our thirst for “cool” shoes to was ridiculous. Case in point — after using many star athletes of the day (Kareem Abdul-Jabbar, Karl Malone, Joe Montana, Wayne Gretzky) to push their line, L.A. Gear turned their attention to the music business. They used campaigns featuring Belinda Carlisle and Paula Abdul (no relation to Kareem) but their biggest coup with wrangling up “The King of Pop” Michael Jackson in a rare bout of endorsement for Jackson. When “the most famous person in the world” signs on to endorse your product, you know you’ve got the public in the palm of your hands. The opening seconds of this commercial are kinda funny to me. It reminds me of that scene from A Nightmare on Elm Street where Freddy is walking down the alleyway. Now there’s an idea! Freddy should’ve worn L.A. Gear in A Nightmare on Elm Street 5: The Dream Child. I don’t think I ever actually owned any L.A. Gear shoes, but I remember wanting some of their L.A. Lights line and I remember many of their commercials. My sister once got a pair of Gears though and I remember taking the little mock license plate keychain that every pair of shoes came with. In the late ’80 & early ’90s, British Knights (or “BK”, if you’re hip) were one of many trendy athletic shoe companies. While L.A. Gear focused on the sunny California lifestyle, British Knights went after the hip hop community and used then-mega rap star MC Hammer to help give the brand some street cred (yes, MC Hammer had cred in those days). Hammer made a nice chunk of change from those commercials– the deal was worth $138 million. That should give you an idea of not only just how popular and important Hammer was in the early ’90s but also how popular and profitable BK was. The company was founded in New York in 1980 (where the name “British Knights” comes from, I don’t know), but it wasn’t until 1986 that the first wave of BKs were released. The decline in popularity for the company is sometimes blamed on the Crips, an L.A.-based street gang, who wore and dubbed them “Blood Killers”. This led to some schools banning BK. That may have played a part, but I also think it was just the world moving on from one fad to the next. Were slap bracelets gender specific? Oh well. I wore’em anyway (I used to wear jelly bracelets and jelly rings too). They were a big deal in the late 80s and up until ’90. 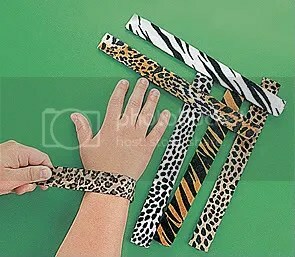 I remember all the kids coming to school with wrists that were adorned with a slap bracelet or two. Now, the good brands wouldn’t hurt you if you slapped it on your wrist, but I had a few cheaps ones which made it feel like someone was smasking you with a ruler. They came in all kinds of styles and colors, but I remember animal prints and standard 1980s neon colors being the most popular. My two prized bracelets were neon orange one and cheetah print. Still, it’s a fun little fad to look back on.